How Does an AC Cool the Air? Do I Need Ducts for Whole-House Cooling? Softball Sized Hail? Is Your AC Covered? 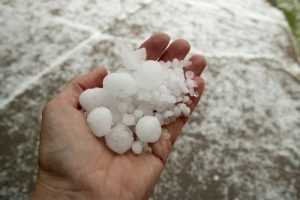 As you have recently seen, hailstorms can be as big as softballs here in Colorado Springs. You will no doubt be concerned about your car, your roof, and even your own noggin when you head outside and the hail starts to fall. Here’s a question for you, though—what about your air conditioner? Your air conditioner cannot run inside and seek cover from the hail, the way that you can go into your house or your car may be parked in a garage. Is your air conditioner covered? And no, we don’t mean in the sense of a protective covering. We’re talking about insurance coverage, in case damage is done to the system in the event of a storm. If you’re not sure, we strongly recommend that you get in touch with your insurance provider. Homeowners insurance policies can vary quite a bit and, let’s be honest—none of us have ours memorized. It is definitely better to be safe than sorry when it comes to protecting your AC’s outdoor unit. The last thing that you want is to be scheduling repairs at the start of the summer, for damages done in the winter! Contact Robbins Heating & Air Conditioning with any questions that you may have.